Monumental 19th century French water gilt mirror with arched beveled plate features an ornamental female face at top central crest medallion flanked on both sides by laurel leaf and berry branches. The upper edge of the frame is adorned with various guilloche, beading, floral and foliage ornamentation. Two human figures sculpted in gesso beautifully flank the mirror on the sides. 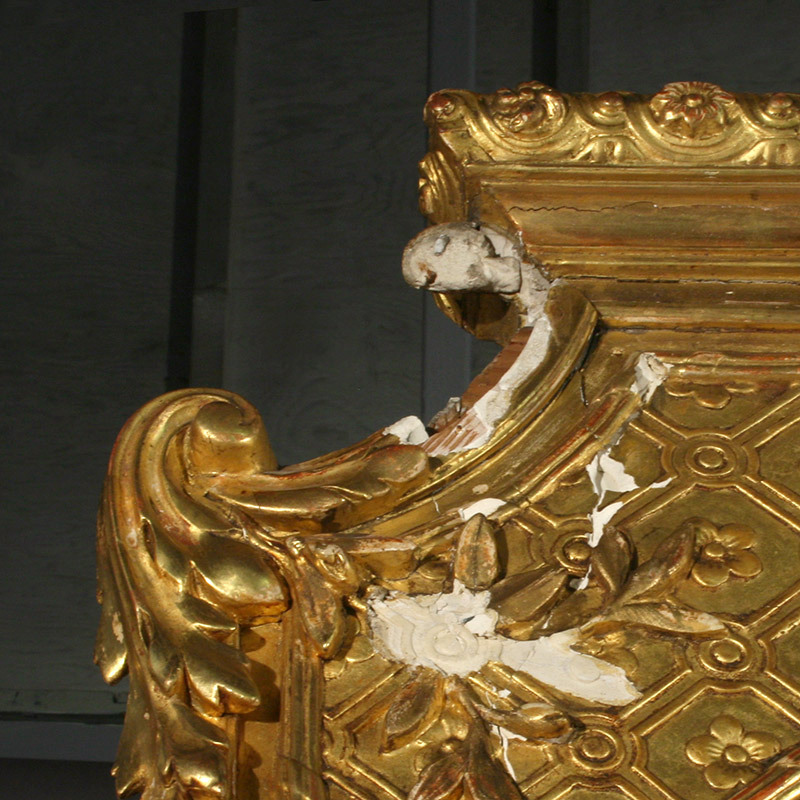 The gilded frame sustained severe impact damage in transport resulting in disfiguring losses to the elaborate ornamentation. The original beveled mirror was completely shattered and at the time of inspection and the pieces of glass were retained with no glass remnants within the frame. There were detached pieces of gilded ornamentation mixed in with the shattered glass. Thirteen pieces of various sized pieces of detached gilded ornament were found at the bottom of the mirror’s shipping crate. 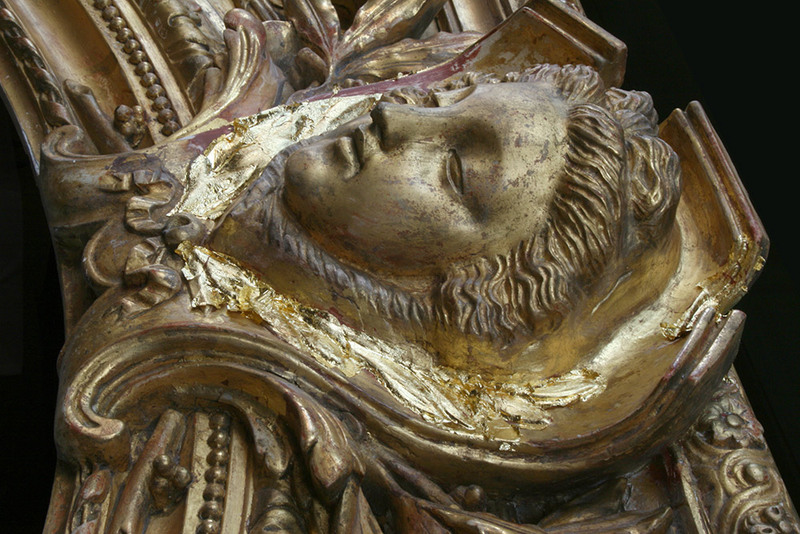 Many losses of gilding and gesso were scattered across the entire frame, with worst area of damage concentrated at the top center medallion cluster with a woman’s face that was completely detached and in pieces. The figure on right side had deep impact abrasions with severe loss of gesso and gilding: approximately half an inch of gesso was completely scraped off the figure’s entire arm and the part of the chest. On the left, top corner there where two large detached pieces with surrounding losses and a large crack that has shifted. Structurally, there was some movement in many of the joints, but no major separations. The wood backing was loose in many sections. The treatment involved the installation of a new beveled panel. 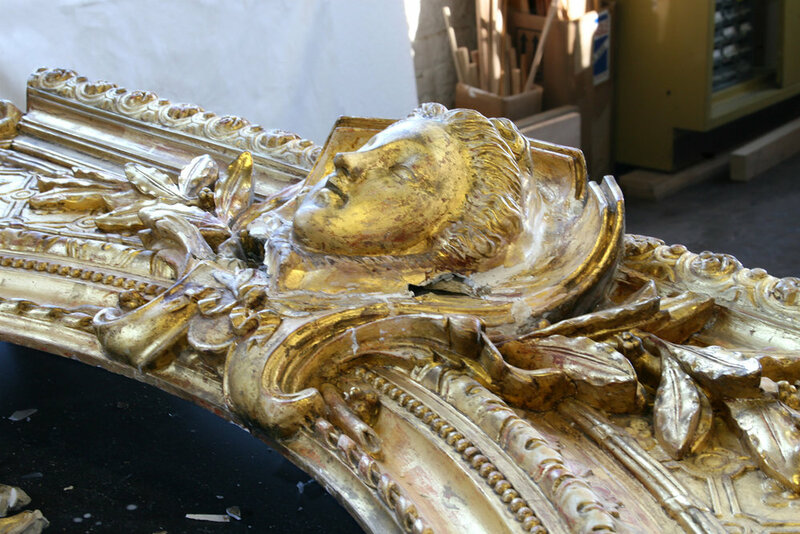 The frame was structurally stabilized, and the original historic gilding was treated. The cracked, loose, and delaminating gesso and ornamentation were consolidated. Detached pieces were reattached, and the areas of losses were infilled to blend in with the surrounding original gilding in profile, color, and sheen. Sculpted figure before treatment. Note deep gesso damage. The missing material had to be sculpted in order restore the shape of the arm face details. The losses were consolidated, infilled, selectively ingilded, burnished, patinated and aged to match surrounding areas.